The SMART Scholarship for Service program supports students who demonstrate outstanding ability and special aptitude in science, technology, engineering and mathematics (STEM). The program aims to increase the number of civilian scientists and engineers working in Department of Defense laboratories. Burchett, the son of Benny and Sharon Burchett, will graduate in May 2012 with a mechanical engineering major and a minor in mathematics. “Yancee possesses the best attributes that we value in a mechanical engineer. 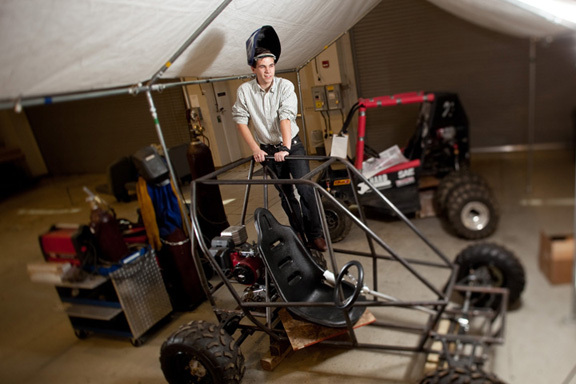 He is an outstanding student academically, but equally important he has embraced the project-based curriculum that we believe truly makes an exceptional engineer,” said Dr. Kevin Schmaltz of the Department of Engineering. The award is one of the most prestigious and lucrative awards available for undergraduate students in the STEM disciplines. As a SMART Scholar, Burchett will receive a scholarship from the Department of Defense that will cover his full tuition and education-related fees, an annual stipend of $25,000, paid summer internship opportunities, a health insurance reimbursement, a book allowance of $1,000 per academic year, professional mentoring and employment placement after graduation. In exchange for the scholarship, Burchett is obligated to fulfill a service requirement for the Department of Defense after he graduates from WKU. For his service requirement, Burchett will spend at least a year working at the Air Force Materiel Command part of the Oklahoma City Air Logistics Center at the Tinker Air Force Base. The SMART Program is administered by the American Society for Engineering Education, the Naval Postgraduate School, and is part of the National Defense Education Network. The program primarily targets what it calls “hands-on-the-bench” researchers and engineers. The scholarship is extremely competitive; scholarship officials anticipated that this past fall 4,000 students from across the country applied for approximately 300 scholarships. Burchett first learned about the SMART program by reading news coverage about WKU’s three past winners. Each year the Office of Scholar Development and the Carol Martin Gatton Academy of Mathematics and Science in Kentucky host SMART scholarship workshops to help students develop strong applications. About the Office of Scholar Development: The Office of Scholar Development is committed to helping students on all WKU campuses and in all majors and degree programs develop the vision, experience and skills to be independent, engaged scholars. OSD welcomes the opportunity to work with students interested in the SMART Scholarship or any other similar opportunities. Contact: Dr. Audra Jennings, (270) 745-5043.